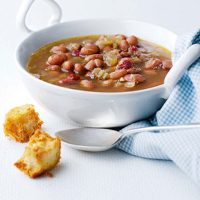 Place the borlotti beans in a large bowl of cold water and set aside to soak overnight. The next day, rinse the beans under cold running water, then drain them well. Meanwhile, place the ciabatta on a baking tray, drizzle with olive oil, sprinkle with 1/2 tsp chilli and season with sea salt. Bake in the oven for 10–15 minutes or until golden brown. Ladle the soup into serving bowls and top with some toasted croutons. shredded cavolo nero, chard or spinach.